Here's my picture to the left. 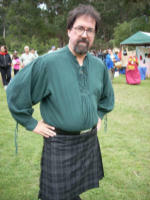 I look like your typical SF Bay Area type guy in a kilt..heheh. This is what I look like nowadays. My real name is Todd. I was born in Encino, California and grew up there. Encino is a town in the middle of the San Fernando Valley in Southern California, and of course was immortalized by Frank Zappa's hit Valley Girl and the movie Encino Man. After I got my BA degree I moved to Oregon, where I was a DJ for a Top40 station in Lebanon, Oregon. That's a town about 50 miles north of Eugene and about 1 3/4 hours south of Portland. I visited there in the summer of 1995 for the first time since I left in 1981, the place had barely changed at all. Sadly, I hear the town has changed quite a bit now. And that Top40 station I worked for is gone, it's now a country station in Portland. I loved it up there; in fact even though I've lived in Northern California for over 25 years, I still miss Oregon. Part of me will always be up there, I think. I've managed to visit the area several times in the last decade, thanks to a few IRC parties I've attended or online friends I've been able to stay with in Portland. I traveled through southern Oregon in the summer of 2000, first time I'd driven through there since 1980, and was amazed at how much that area has grown in the last 20 years. I`d move back up to Oregon if I could, but I think I`d really miss the Bay Area. I moved to Northern California in 1981. I`ve lived in various places in the San Francisco Bay Area including Fremont, which is where I lived for just over twenty-three years. I moved to San Francisco in 2008, and while I do miss Fremont I've always wanted to live in San Francisco, truly one of the great American cities. In May of 1998, I visited my old neighborhood in Encino for the first time in 20 years..sadly it too had completely changed. Guess that's progress for ya. Speaking of San Francisco, if you're interested in learning more about this city, visit The San Francisco Museum site. Or to find out about SF's great history, go to their Index to San Francisco History. And not to mention the great institution (alas, only in our memories now) of the Doggie Diner or even the last publically displayed Doggie Diner head. As I mentioned on my main page, I used to be a technical writer and did that for many years. I've also designed and maintained several web sites over the last few years for a few different organizations, which was at times challenging but also fun. I'm currently pursuing a career in the infosec field, one that is exciting but also challenging and constantly changing.